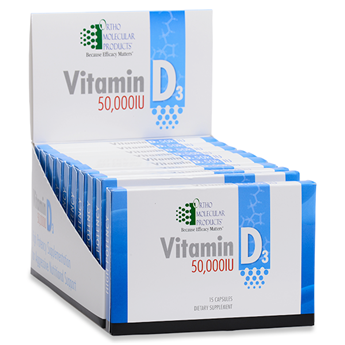 Vitamin D3 50,000 IU is ideal for those who have difficulty achieving and maintaining peak vitamin D levels. This often includes elderly patients with low vitamin D levels; those with challenges in absorbing and maintaining vitamin D levels; and overweight patients with an elevated body mass index that impairs vitamin D circulation requiring significant repletion doses. For those who require an immediate boost in their vitamin D status, Vitamin D3 50,000 IU is a convenient, effective way to get the substantial support they need. 1 capsule per week or as recommended by your healthcare provider.